The idea is simple: serve USDA prime, and choice steaks with a signature marinade, cooked over mesquite charcoal. Austins Steakhouse, located at Texas Station in North Las Vegas, really knows how to make meat taste good. Having a vague idea of just how much food they serve around these here parts, we inquired about the special of the evening: a pepper encrusted roast beef. The waiter informed us that the cut was about 2 pounds worth of meat. TWO POUNDS. That's a lotta cow. Not ones to shirk our duties as true meatotarians, we ordered the roast, along with a side of the Austin's potatoes and the spinach and mushrooms. The roast beef, was in a word, DELICIOUS. The meat was amazingly juicy and tender, flavorful from the crushed pepper rub, and in such vast quantities that the three of us could only finish 3/4 of the plate. It also went quite well with the pile of twice-cooked (fried) potatoes and the surprisingly good combo of sauteed spinach and fresh shitake mushrooms. Additionally we had the deliciously crisp Caesar salad, which came with a classical dressing and parmesan tuile. The quality of the salad was a cut above anything I have ever had in Boston. Sad, but true. For dessert we went for the molten chocolate cake - something I can easily make myself, but still couldn't turn down. My advice: skip the starch and go for the steak and vegetable options. They may fly the produce in from California, but it arrives on your plate, crisp, flavorful and perfectly cooked. Away from the faux-swank lounges of downtown Boston, the Beehive is a true gem of the South End. Named after La Ruche, an artists' residence in the Montparnasse Quarter of Paris during the 1920's, the Beehive is a unique alternative to other late night spots. Filled with the work of local artists on its exposed brick walls, funky antique style wrought iron and crystal chandeliers hanging from the high ceilings, and the sounds of a local jazz band resonating throughout basement space, the air seems cozier, French-ier and hip-without-being-too-overly-hip. Who knew Boston could be so cool? For drinks we tried the Pimms Cup, a classic mix of Pimms and ginger ale, with a cucumber and lime garnish. 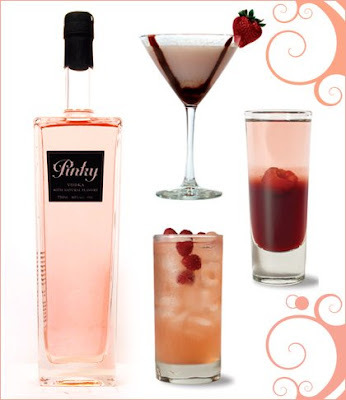 The well-balanced champagne cocktail, La Vie En Rose, contained a lychee infused cognac. Despite the hour, the kitchen stayed open and served a small late-night menu. The frites were hand cut strips of potato that were lightly salted and served with deliciously crispy fried sage leaves. The "poutine" was not really poutine, and instead an admittedly very tasty combination of frites, rich gravy and melted cheese. As a poutine aficionado I take issue with the menu label, but would still order this item again. The Beehive: Great drinks, good food, and an atmosphere that will make you feel hip just by being there. The historical hot dog eating contest between reigning human champion, Kobayashi, and a 1089-pound Kodiak bear. 50 bunless hot dogs in 2 minutes and 36 seconds: this bear's not messing around! While on holiday in Vegas, we stopped by the gorgeous Bellagio Hotel. Filled with freshly cut orchids, and covered with gorgeous mosaic tiling, this place was decadence to behold. In the lobby one can look up to larger-then-life hand blown glass flowers by Dale Chihuly. And of course, a true world-class resort is not complete without its own World Pastry Champion. Stop by and see the work of Chef Jean-Philppe Maury. Be dazzeled by the floor-to-ceiling glass chocolate fountain, or the beautifully crafted chocolates, pastries, cakes and crepes. My personal favorite was the elegant strawberry tart: bright, fresh berries sliced atop a thin, swirly macaroon and light vanilla cream. Yum! This Chocolate Lady weighs in at 120 pounds! ...and after a delicious pastry, why not stay to see the famous Bellagio fountains out front? Photos lifted from www.bellagio.com and taken at the Bellagio. 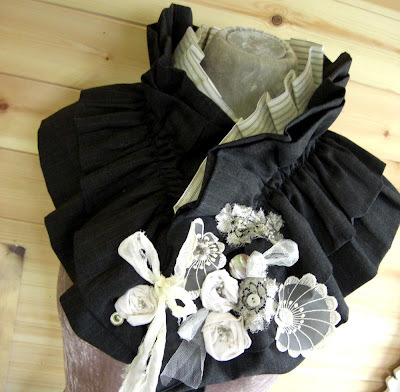 Bonzie makes a fabulous assortment of custom made jackets, corsets and Victorian style scarves. I was originally attracted by the fantastic spats (in tweed.) However, in the end, I opted for a gorgeous, custom-designed scarf with lace flower and beading detail. I think this piece will go perfectly with a black coat. Let's hope summer holds off for a little while longer so I can take my new purchase out for a cocktail! 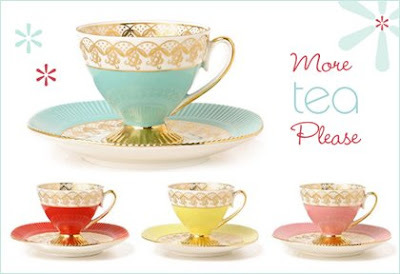 Be inspired by a fun and chic selection of gifts, supplies and entertaining ideas! A friend of mine is graduating this May, and rather than ply him with the obvious (a nice aged whiskey) I opted to get him some cigars. I actually hate cigars. I'm less of a cigarette fan due to that horrendous smell and the dangers of second-hand smoke. Cigars, in contrast, can sometimes smell relatively pleasant (though not as good as a quality pipe, but who smokes pipes these days?) It's with the old boy's club elitism associated with cigar smoking that I take issue. When I see twenty or thirty-somethings trying to be hip or cool, standing around in a cloud of their own haughty smoke, I can't help but think, "Hmm, all they need are a couple of leather armchairs and a glass of cognac." I do love window shopping and shopping for other people, so how could this excursion be any different? Step 1: Locate a tobacconist shop that sells hand rolled cigars. Fortunately, Leavitt and Peirce is located right in Harvard Square. Step 2: Arrive at the cigar store and check out the merchandise. After first perusal it became apparent that I was completely useless in a smoke shop. Step 3: Let the salesperson know what price range you are looking for. A good cigar will cost around eight to twelve dollars. Out of curiosity I also inquired after a fairly innocuous looking, leather "cigar" holder. When informed that it was $65 I remarked (aloud, but mainly to myself), "that's an awful lot money for something that just holds cigars." The twenty-something tobacconist just looked back at me blankly. Step 4: Ask the salesperson to see either a mild, medium or full flavored cigar. The mild is a light smoke while the full has a heavy bodied more intense flavor. "Do you know anything about cigars?" asked the twenty-something tobacconist. I gave him the do-I-LOOK-like-the-kind-of-person-who-would-give-a-#@%* look and said, "not particularly, but how about a mild to medium variety?" Step 5: Choose a cigar size. They are measured by length and ring gauge. Many connoisseurs favor a size between 5 and 6 inches in length with a number 50 ring gauge—the higher the gauge the larger the diameter. Again, do-I-LOOK-like-the-kind-of-person-who-would-give-a-#@%*? Step 6: Select a wrapper. Notice all the different shades of the tobacco wrappers due to the type of plant, soil, processing and country. Two basic ones are natural and Maduro. The Maduro are very dark in color and have a distinct taste. Whatever. I ordered two of each cigar the twenty-something tobacconist suggested. Step 7: Buy the cigars...and beeline it for the nearest girly shop to cleanse oneself of that lingering tobacco smell. 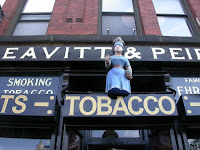 Despite my obvious distaste for tobacco, Leavitt and Peirce is a fascinating shop in which one is transported to another time period entirely, complete with original vintage glass countertops and black and white checkerboard tiled floor. The shop is filled with cases of cigars, classy silver lighters and pocket watches, cufflinks, British bars of soap and old-fashioned shaving equipment. There is even a small jewelry section in the back of the shop, presumably for the bored-silly wives and girlfriends. 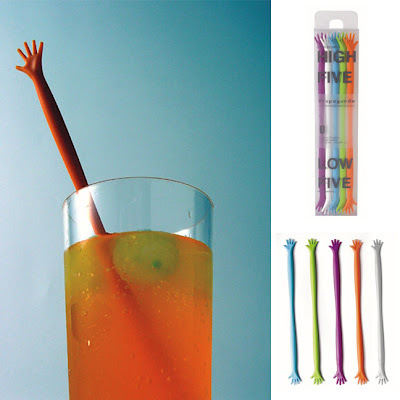 Hands up, hands down, these funny looking stir sticks are the perfect pairing for your summer mojito! They come in a variety of candy colors, six per pack! Check out these party cups with personality! 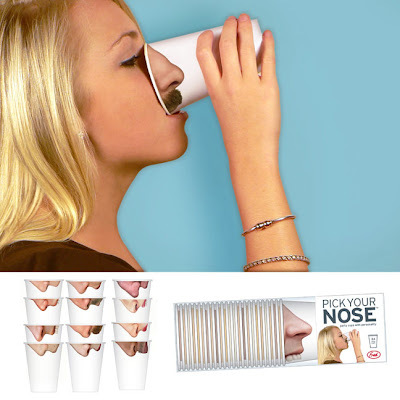 Paper cups with photo-realistic images will bring fresh embellishment to the ordinary nose. 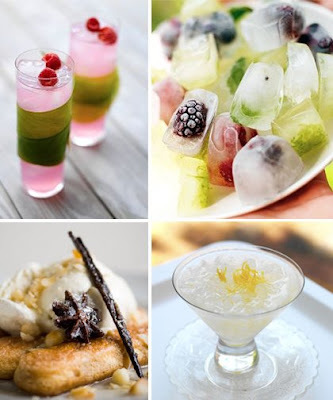 Tip your drink and instantly you'll be transformed! Comes in both male and female proboscises. Looking for a way to spice up your workplace? Check out Mr. P, he's always getting himself into sticky situations. 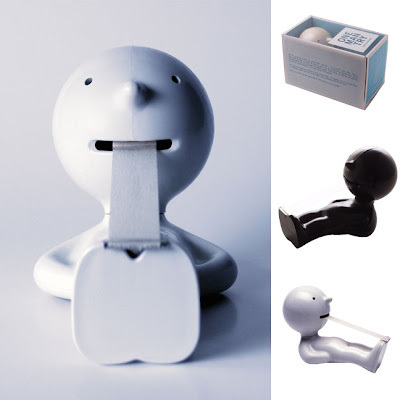 Just pull tape from his mouth and tear off what you need using his serrated shoes. Problem solved!